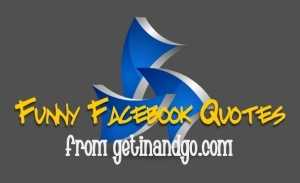 Enojoy Friday’s Funny Facebook Quotes this week. Do you have any memories from your childhood that would have made awesome Facebook status quotes? My son’s new obsession is hiding ice. Under a couch cushion, in the hall closet, under my pillow… I’m about to turn off the ice maker. I’ve come to realize that it is not good to look like a Dr. Seuss character. My house smells like old lady kitchen and I cannot find the root cause of it for the life of me. Super clean, here I come! Our little mouse prefers cheddar over Monterey jack, and doesn’t care at all for peanut butter. My two year old has been crawling on the floor, barking and licking my legs all morning. Cute > annoying for sure! On the way home from work yesterday, I became the victim of a fly by pooping. It was probably a band of stool pigeons. What the heck was a bird doing flying around in the snow anyway? You know this just makes my whole week! wounds = sounds… is it friday?? Hmmmm I will have to think about the when I was a kid status theme.. wounds challenging!